The Close Quarters Battle Receiver (CQBR) is a replacement upper receiver for the M4A1 Carbine. 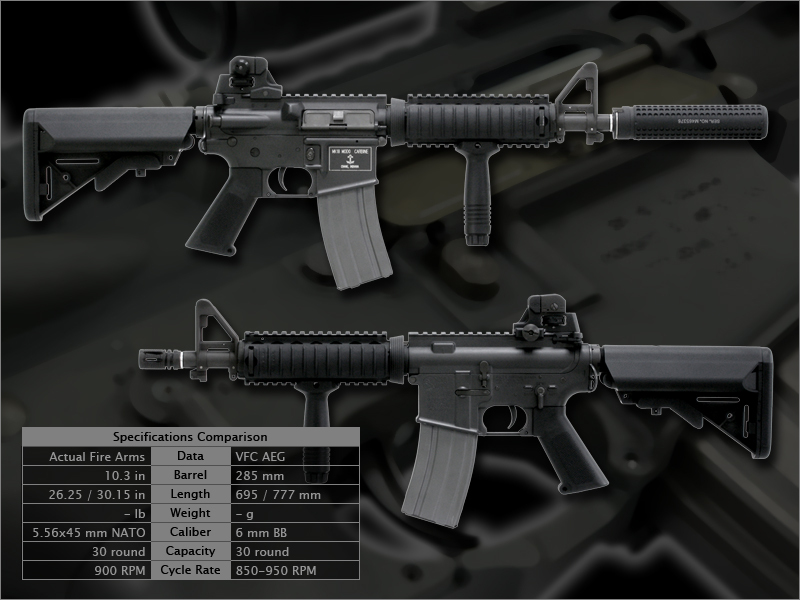 The CQBR upgrades the M4 with a barrel 10.3 in (260 mm) long, the modern equivalent of the Colt Commando short-barrel M16 variants of the past. Its preliminary National Stock Number was 1005-LL-L99-5996; however, a complete CQBR-equipped carbine now has the NSN 1005-01-527-2288. The overall length of the upper receiver is 19.25 inches (489 mm). With the stock retracted, the overall length of the weapon is 26.25 inches (666 mm). The CQBR entered service in 2000. SOPMOD Block II kit, the CQBR has taken off on its own. 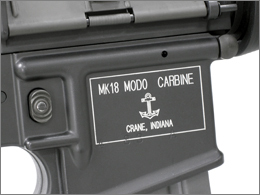 Like the proposed Special Purpose Receiver, the Close Quarters Battle Receiver has been more or less taken on by the Naval Surface Warfare Center, Crane Division (often referred to as NSWC-Crane or just "Crane") as its own project following the CQBR's removal from the SOPMOD program. 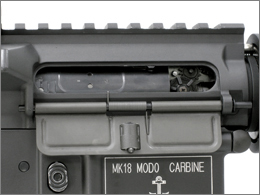 Just as the Special Purpose Receiver morphed into the Special Purpose Rifle, and was type-classified as Mk 12 Mod 0/1, the complete CQBR-equipped carbine has been type-classified as the Mk 18 Mod. 0. The purpose of the CQBR remains to provide operators with a weapon of submachine gun size, but firing a rifle cartridge, for scenarios such as VIP protection, urban warfare, and other close quarters battle (CQB) situations. 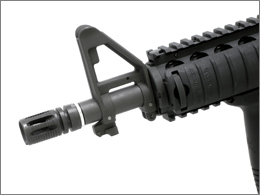 The CQBR is designed to provide improvement over previous AR-15/M16-type weapons in this category. The CQBR is usually issued as a complete weapon system, and not just an upper receiver. The CQBR was once only available to Naval Special Warfare units, but the Mk 18 Mod 0 has become general issue for Visit, Board, Search, and Seizure (VBSS) missions. NCIS agents deploying to active combat zones are also issued the Mk 18 as of summer 2006. The short 10.3 in (262 mm) barrel length requires special modifications to reliably function. The gas port is opened from 0.062 to 0.070 in (0.16 to 0.18 mm). A one-piece McFarland gas ring replaces the three-piece gas ring set. The standard 4-coil extractor spring is replaced with a commercial off-the-shelf (COTS) 5-coil spring. An O-ring surrounds the extractor spring. Upper and lower receivers: The lower receiver is a standard M4A1 lower receiver with no modifications. Internally, the CQBR also takes advantage of a larger gas port and modified bolt carrier and buffer assembly. The gas port has been opened to 0.070 in (0.18 mm). A number of Lewis Machine ＆ Tool 10.5" (266.7 mm) upper receivers have also been reported to have been purchased for the CQBR program. 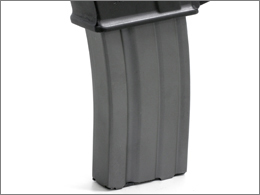 These upper receivers feature a gas system optimized for short barrel use. 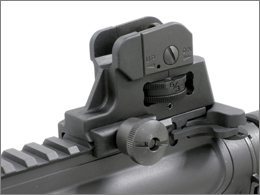 Sights: Initially, detachable carrying handles cut down so that only the rear sight assembly was used. However, most of these have been replaced with the similar, commercially-made Lewis Machine ＆ Tool adjustable rear sight. Also used are several types of reflex and magnified optics, most commonly seen is the Aimpoint CompM2 in a Wilcox Industries Corp. Picatinny mount. 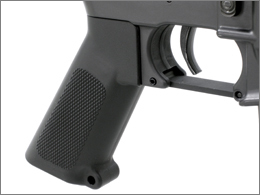 Stock: A variety of M4 retractable buttstocks are used on a standard 4-position receiver extension. Most often seen is the SOPMOD stock, often referred to as the "Crane stock", created by Dave Armstrong of NSWC-Crane. 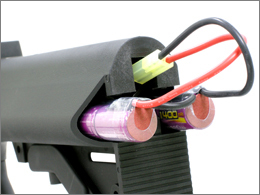 The angled stock offers better cheekweld as well as providing two storage compartments for spare batteries. The stock must be removed from the weapon to access the storage compartments. The initial run of stocks was made by NSWC-Crane from glass fiber polymer. Because of this, they were somewhat fragile and did not always properly lock into the receiver extension. A rubber band was used to secure the latch so it would not slide out of the desired position. 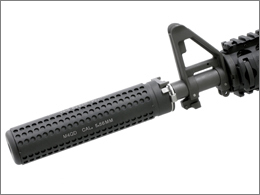 The current SOPMOD stocks are made by Lewis Machine ＆ Tools and have none of the problems. Barrel: The CQBR uses a standard 1:7 in (178 mm) twist M4 barrel that has been reduced in length to 10.3 in (262 mm). The diameter of the barrel under the handguards is 1.17 in (29.7 mm). The KAC M4-QD flash suppressor is fitted, allowing use of the KAC QDSS-NT4 suppressor (National Stock Number 1005-01-437-0324). Although it has a bayonet lug, the CQBR is not meant to be fitted with one. 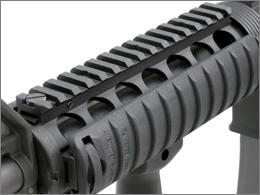 Handguards: The standard handguard for the CQBR is the Knight's Armament Company Rail Interface System (M4 Carbine RIS; National Stock Number 1005-01-416-1089), which is designed for a variety of barrel profiles and allows for the use of any MIL-STD-1913 tactical accessories such as the AN/PEQ-2 infrared pointer, SureFire flashlights or a vertical forward grip. 77-grain Mk 262 cartridge is preferred. There are no plans to rechamber the weapon in any additional calibers.